Marie did a fantastic job on my visit, and provided more than enough to help me start the process. I appreciate her help. We were very impressed with Tony, he seemed to know everything that we needed to know. Tony was very courteous and very professional. I am currently in L.A. County so I cannot use them, but let them know that LaVon is an asset to their company. She was professional, knowledgeable friendly and helpful. I will tell others who live in the area about her. She was great. I came in once and then went back with my husband. We did like Ma Williams and our salesperson, Tim. We will be in touch when we know what we are doing. I inquired with Ma Williams awhile back and then revisited. I have been speaking with Tim, who has done a great job. Tim has been very helpful with everything. We have a newborn baby and are ready to move into our new home as soon as possible. When Jeannette “Ma” Williams started her business in 1969, she never would have dreamed it would grow into one of Southern California’s premier manufactured and modular home dealerships. Today, we are a third-generation, family owned and operated company, that is still guided by the principles Ma established nearly 50 years ago: The customer always comes first; let’s always provide high quality homes at the most affordable prices, and Ma’s motto – we will not be undersold! Companies, like people, are defined by what they do; for us, that means taking the time to get to know our customers, and what they are looking for in the home of their dreams. It means treating customers with respect every step of the way, and bringing all of the things we’ve learned in this business to meeting the specific needs of each home buyer. We owe our success to our customers, and that’s why we insist on always providing the best home value in Southern California. Perhaps that is why Ma Williams receives so many referrals from happy home buyers. Also, you may click the link to the Better Business Bureau where our company is A+ rated. We would be honored if you would consider buying your next home from Ma Williams. Why Do Business with Ma? Ma Williams Value: We simply won’t be undersold. You can always be assured of a home from one of the top builders in the industry, at the best value available. Ma Williams Integrity: You won’t hear promises from us that we can’t keep. We’ll always tell you the truth about your home purchase, and keep our word as we go through the purchasing, financing and building process. what has been completed and what still needs to be done or what hasn’t been done. Ma was a happy stay at home Mom until her boys were out of school. That’s when she started a business selling used “mobile homes” as they were known in those days. She added new home sales a few years later, first by driving customers to the Kaufman and Broad factory in Perris, California to spec them out. She said, “We’ll sell you the home at 10% over costs and show you the factory invoice,” and she did. In 1982 her son Dennis joined the company. He used his real estate background to explain to customers the value and advantages in placing homes with permanent foundations on private property. Kelly Williams-Walsh obtained her Master’s in Business Administration at San Diego State University, with an emphasis in Real Estate and the integration of technology within the new construction realm. Kelly Williams-Walsh joined the business in 2001 and put this education to good use by helping her father, Dennis Williams, develop “Ma’s” revolutionary new 12 Step Program to help track custom home developments from start to finish. Ma Williams Manufactured Homes, Inc. is now a third-generation family owned and operated business; and don’t be surprised if Chelsea, Samuel, and Luke, the fourth generation, greet you at the front door. Tony was great. He was very knowledgeable of your homes and answered all of our questions. 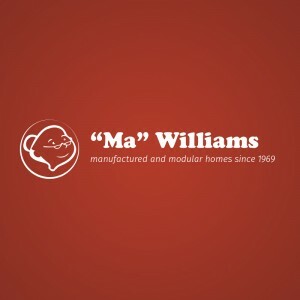 We visited Ma Williams originally a couple years ago when we were thinking of buying a manufactured home. Back then we wanted to see models and ask questions about the process. Everyone was very welcoming and helpful. We walked away feeling satisfied with what we learned and were impressed with the models. Finally in 2018 we purchased a vacant lot and went back to Ma Williams to pick out a home. Starting from scratch with a vacant lot and looking at many models is a long process and can be very overwhelming, but Ma Williams has been so supportive and patient with us. Tony has been readily available for any questions or concerns we have regarding the house plans as well as Jenean for the loan process. Thank you to all the staff at Ma Williams for helping us with our dream home! I look forward to meeting Tony. He was extremely helpful on the phone! I am very pleased with my experience at Ma Williams. Lavon has been very helpful and great about keeping in contact.